September was a busy month at Action for A-T, with two big groups of supporters Cycling for Research in separate challenges. 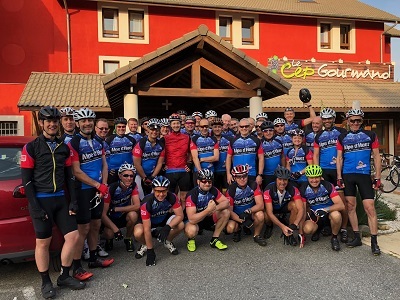 Our first event took place on 15-16 September, with a team of 35 cyclists covering 250km over two days from Lyon to Bourg d’Oisans. This involved climbing almost 15,000 feet, including taking on the iconic and daunting 21 hairpins of the legendary Tour de France stage of Alpe d’Huez. In hot conditions, with temperatures over 30 degrees, every rider conquered the climb and made it safely to the summit. An amazing achievement for everyone involved! Our next event was the second BCA cycle challenge on 20-22 September. 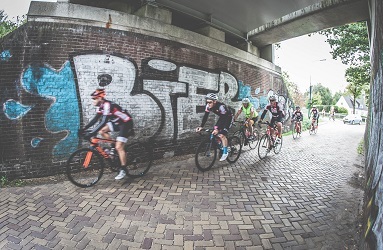 Following on from last year’s hugely successful Blackbushe to Paris cycle, this year the 60 strong team were taking on the 400km route from Bedford to Amsterdam over 3 days. In very different conditions to the previous weekend, the team battled against wind and rain along big sections of the route. A welcome pit-stop on Day 2 was a visit to the BCA site in Barneveld, where a warm welcome awaited the cyclists from their Dutch colleagues. The team successfully reached Amsterdam on Day 3, posing for photos in front of the famous IAMSTERDAM sign on Museumplein. These two events raised a staggering £135,000 between them, enough to fund an entire A-T research project. A massive thank you and congratulations to everyone that took part, what you achieved in your challenges and your fundraising is truly inspirational.